These cats might not be the most productive employees on payroll, but they’re definitely cute, cuddly and awesome. No doubt they’re also good for business if they attract cat people into the door, just for the sake of seeing a cat. We hope you enjoy meeting them and please let us know of other area business cats you’d like to see featured here! Email your suggestions to cheys@Inlander.com. The first business kitties in the Inland Northwest Business Cat series we’ve chosen to profile are already pretty well known by fans of and Facebook friends of Spokane Vintage Warehouse, an East Spokane business that’s literally bursting at the seams with some of the coolest, strangest and most interesting vintage finds around.If you follow Spokane Vintage on Facebook, there’s a good chance you’ve seen its three resident felines sneaking into photos of items for sale that are posted online. This is something all three cats tend to do pretty often, the business’s owners Jon and Heather Swanstrom tell me. “We include them in posts all the time,” they say. Most of the time, that’s the only place you’ll actually see these three, unless the weather is a little warmer and the kitties decide to sun themselves on the warehouse’s enclosed patio off the front of the building. To keep the kitties safe and happy, though, they’re mostly working behind the scenes in the back, helping run Spokane Vintage’s Facebook page and, of course, sneaking into the occasional photo, the couple says. The Spokane Vintage cats' favorite on-the-job task, the Swanstroms say, is helping unpack new inventory and overseeing the packing of orders to be shipped. 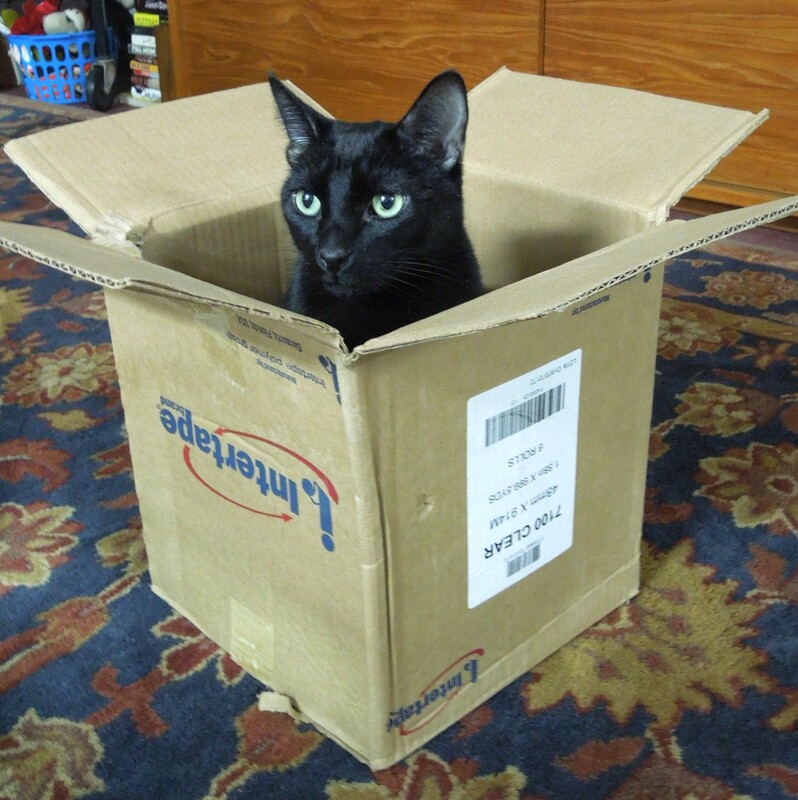 Both jobs involve boxes and if you know cats even the tiniest bit, you know they almost never resist a good box. 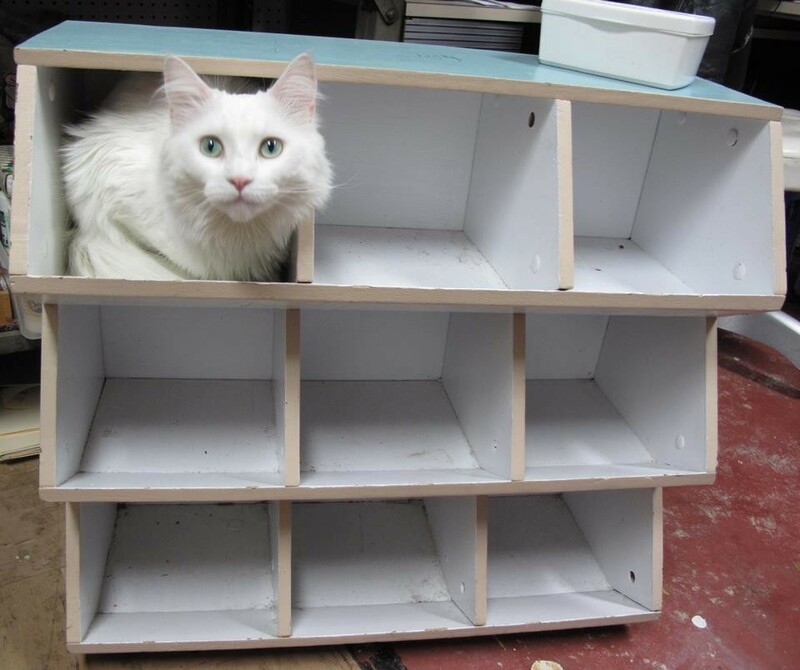 The most outgoing of Spokane Vintage’s feline trio is the beautiful and regal Zoey, a 3-year-old, pure white, medium-haired girl who is most likely of the Turkish Angora cat breed, her owners say. They’re not totally sure about Zoey’s lineage since she was discovered as a kitten by their daughter, Nash, on the South Hill and most likely was abandoned since in the end no one came forward to claim her. 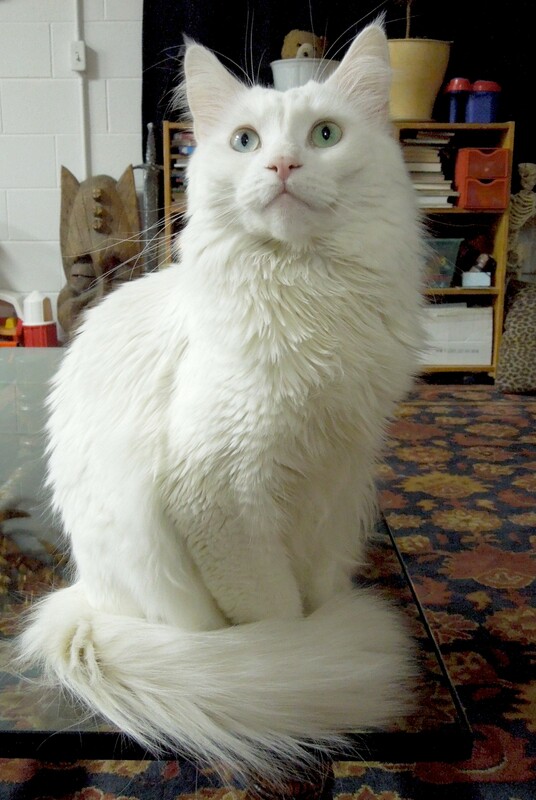 Zoey, a three-year-old Turkish Angora mix. Aside from her stately, feathery tail and luxurious coat, Zoey’s eyes are incredibly striking, fading from light green in the outer iris to a teal color around the pupil. The Swanstroms say that Zoey is a very smart and intuitive cat, and she loves to jump as high as she can to catch the laser pointer’s red dot, as well as play with her best kitty buddy, Aiden, the lone male of the bunch. The couple estimates Aiden is about 7 or 8 years old, and came to be a member of the family as a tiny little kitten. Aiden was born the runt of his litter to a feral mother cat. “He was so tiny I could hold him in my hands,” Jon says, adding that when the pure black, silky-coated shorthair was a baby he never cried out like other kittens usually do. To this day, Aiden still has a tiny, quiet meow, he says. Aiden’s grown to be a bigger kitty now, and is a complete lover of his humans. He always helps out with work around the warehouse, especially if boxes are involved. At one point, Heather tells me, she discovered that Aiden seems to have no feeling in most of his tail except for about an inch at the base. She learned this when one day he slipped behind her just as she was closing a door, and his tail didn’t quite make it all the way through before the door shut. “He didn’t scream like most cats would,” she says, and instead (unsuccessfully) tried to wiggle himself free, not understanding why he couldn’t move forward. Though his tail is proportionally shorter than most cats’ and a little crooked, Heather says Aiden doesn’t seem to be affected by a lack of feeling in it at all.Spokane Vintage’s third helper kitty is little Zelda, who also was born to a feral mother — she’s Aiden’s younger sister, too, but has a different dad cat — and who’s seemed to retain some of her mother’s shyer traits, the Swanstroms say. “She’s more skittish, but she’ll sit in your lap and she drools when she’s really happy,” Heather says. 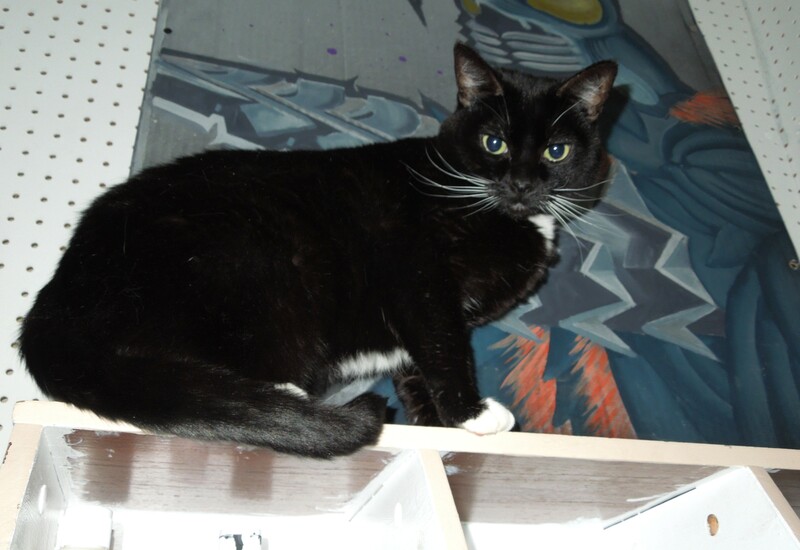 The petite 5-year-old is mostly black except for her white-tipped paws, white chest and belly and white whiskers that flare out in different directions from her cheeks. Though she’s the shyest of three and wasn’t too keen to have her picture taken, Zelda let me pet her a few times before she decided to quietly observe my intrusion into her territory from a high shelf in the warehouse. As I talked to Jon and Heather about their furry trio, it was clear that they truly love their three rescue kitties. And with the very important duties as the Spokane Vintage Warehouse’s official mascots and assistants — along with the love and attention of their doting humans — I don’t think these cats could ask for a better life!